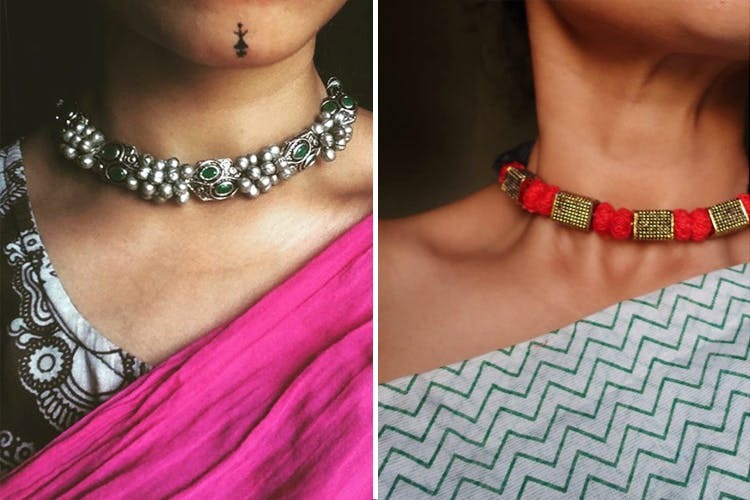 Thulika offers unique handmade costume jewellery that marries ethnic flair with contemporary design. Whether you prefer delicate, dainty neckpieces that sit snugly at your throat or would rather accessorise your outfit with bold statement pieces that make for the best conversation starters, Thulika is the place for you. Handmade and hand-assembled, each piece in the collection is not only one-of-a-kind, but also customisable according to color or pattern preferences. Primarily modelled after ethnic, tribal-inspired jewellery, Thulika’s pieces are a refreshing change from the mass-produced costume jewellery that floods the market. At Thulika, choose from a variety of designs. Creative combinations of otherwise different styles lead to very interesting pieces – Kolhapuri molds strung together with tiny jhumkis make for a unique neckpiece, ghungroos are sequenced with the same Kolhapuri molds for a richer look, and various-coloured thread and metal balls, coins and pendants of various shapes come together for stylish, tasteful pieces that can be teamed with both Indian and western wear. Dress up a plain white shirt with a four-layered bead choker in vibrant purple and muted grey for a chic look, or opt for tiny antique-lookalike pendants or lotus droplets strung together with thread balls to complement an understated outfit. Eager to be one-of-a-kind? Choose from among the stunning vibrant, hand-painted terracotta and wooden pendants available and customisable. Thulika also creates customised nameplates and other knick knacks. Whatever your preferences – avant garde, traditional or contemporary, delicate, chunky or understated – Thulika has something to offer you. The best part? The pieces are affordable even to young college-goers, and range from INR 500 to 800.